Venango County is located in western Pennsylvania about halfway between Pittsburgh and Erie. The County seat is located in the City of Franklin at 1168 Liberty Street. The county was established in 1800 and the present courthouse was built in 1865. The County seat is located in the City of Franklin at 1168 Liberty Street. The county was established in 1800 and the present courthouse was built in 1865. PA Oil Heritage Region with its outstanding artifacts, scenic views, area museums, cultural traditions and the communities themselves continues to depict the Oil Region's legacy as the birthplace of the petroleum industry. French Creek is a tributary of the Allegheny River in northwestern Pennsylvania and western New York in the United States. Creek is somewhat of a misnomer, as it is generally considered to be a river, which is reflected in earlier names for the stream. It was known to Native Americans of the region as Onenge, meaning Otter. This was corrupted into English as the Venango River. A settlement at its mouth was likewise called Venango, and is the site of present-day Franklin, Pennsylvania. 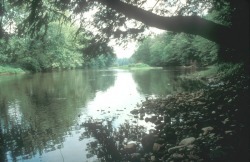 In the 18th century, the stream was an important link between the Great Lakes and the Ohio River. The French built Fort Presque Isle and Fort Le Boeuf to control the portage from the stream's headwaters to Lake Erie. They called the stream Riveraux aux Boeufs (Meaning River with Buffalo). George Washington was sent to deliver a message to these forts in 1752. Not knowing the stream's name, he gave it the present name of French Creek because of the nearby French forts. It is formed near French Creek, New York and extends for a length of 117 miles (188 km) with a drainage area of 1,270 square miles (3,289 km²). It joins the Allegheny River near Franklin, Pennsylvania. The watershed area includes parts of Erie, Crawford, Venango, and Mercer Counties in Pennsylvania as well as Chautauqua County, New York. French Creek is considered one of the most biologically diverse streams east of the Mississippi River providing habitat to over 80 species of fish and 26 species of freshwater mussels. Franklin exists because of its location on French Creek where the creek flows into the Allegheny River. More than two centuries ago, both the French and the English would come either south from Lake Erie by way of the French Creek waterway or north from Pittsburgh following old Indian trails or the Allegheny River. The imperial and colonial interests of both eighteenth century European powers interacted and clashed along this north-south route in the wilderness of Western Pennsylvania. Both the French and the English occupied forts in Franklin. After the French and Indian War and the War of Independence, Franklin began to prosper as a commercial center and the seat of government for Venango County, a very large Pennsylvania County in the early nineteenth century. French Creek was Franklin's most essential natural resource. The creek provided power, water power, to operate a number of grist mills, saw mills, woolen mills and iron works situated in the 1840's and subsequent decades along its banks. Dams were constructed in the nineteenth century across French Creek to provide the necessary water pools. The mills are all gone. The dams are all gone. The surviving evidence of this thriving, mid-nineteenth century commercial activity can be seen in Franklin's Greek Revival residential architecture from the period. A concentration of examples in the 1200 block of Elk Street, just across from the old public commons, is particularly impressive. Other vestiges of Greek Revival architecture and the contemporaneous, less stylish National Folk houses of the times can be seen scattered along Franklin's nineteenth century streets. In the early 1860's oil was shipped down the river from Oil Creek to Pittsburgh. The Atlantic and Great Western Railroad arrived in Franklin in 1863. Some of the crude oil coming down the river from Oil Creek was then transferred to the railroad and shipped either north and east to New York City or west to Cleveland. A second rail line, the Jamestown and Franklin, entered the Oil Region at Franklin in 1867. The competition between these two railroads for the crude oil traffic to Cleveland almost immediately led to favorable rates and rebates for the owners of the Cleveland refineries at the expense of refiners in Pittsburgh, Philadelphia, New York and the Oil Region, itself. One Cleveland owner, John D. Rockefeller, exploited this advantage to its fullest. Franklin prospered as a rail terminal. Many of its citizens became particularly successful oil producers. In the late nineteenth century, Franklin became a center for refining crude with its largest facilities being owned by Rockefeller's Standard Oil. Most of Franklin's fine Victorian homes represent the prosperity of these times.